Music photograher Graham Smith will mark a decade of work with an exhibition at Oh Yeah, November 2-9. Titles ‘I Like The Way This Is Going', there's a launch night on November 2 at 7.30pm, featuring live music from Ollie Cole (ex Turn) and a DJ set from Chris Wee (And So I Watch You From Afar). 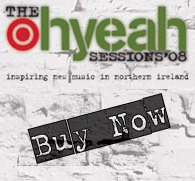 © Copyright 2009, Oh Yeah Music Centre Ltd, 15-21 Gordon Street, Belfast, BT1 2LG.